Remember that really awful Double Dragon movie from the '90s that had Alyssa Milano in it? Man that sucked- which was disappointing on so many levels, not the least of which was that the original DD game was such an awesome game. Whether you remember it from the NES or the Arcades of years gone by, it's a true classic of the medium. And now Aksys Games and developer Brizo Interactive is bringing the battling Lee brothers to the iPhone with the aptly titled: Double Dragon iPhone. It actually looks really good with redrawn character art and backgrounds- it'll have new music as well. 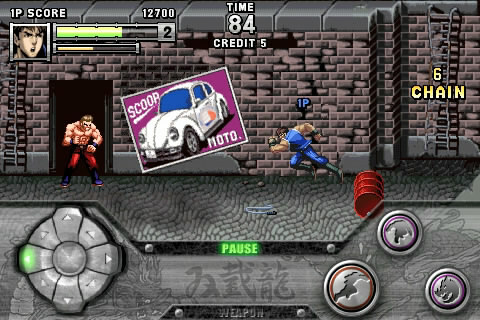 Double Dragon iPhone launches on the App store this March. Double Dragon for a New AgeDouble Dragon iPhone has been completely reborn with new remixed music and all new art and character sprites. 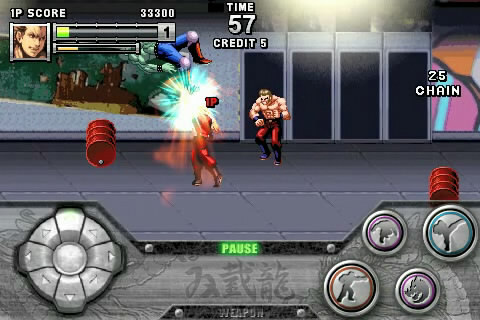 All New Double Dragon Experience With new attacks, enemies, bosses, and even achievements and hidden characters to unlock, Double Dragon iPhone is nothing short of a new Double Dragon experience. Easy Combo and Control Scheme With an easy to use on-screen controller and combo system, you’ll be ready to take on an entire horde of thugs in no time! Bluetooth Multiplayer Team up with a friend via Bluetooth in Double Dragon Mode and take to the mean streets together.